The method "Route by Redirection" allows that all the users can use the same voice mail number (voice pilot number) and nevertheless have their individual voice box. Because of this, this number can be entered in the PBX globally as "dropping number". Moreover, all the users can call this number from their office telephone in order to access their mailbox by telephone. If available, a key for the call-back to the mailbox can be configured in the PBX globally. As "voice mail number", the number 9999 has been determined. The PBX routes all the calls to this number to the ixi-UMS Business Kernel. A user switches the call transfer at his telephone to the number 9999. When a call comes in at the user's phone, this call is transferred to 9999. The ixi-UMS Business server accepts the call, but evaluates the originally dialed number, the telephone number, and searches for this telephone number in the specified LDAP database. When user is found to this number, the deposited announcement is played. The caller can leave a message, which is sent to the mail server and then to the mailbox of the user. The user can access this voice-maiboxl e.g. by calling the number 9999 from his office telephone. He then is connected to his mailbox immediately. 1) ixi-UMS Business must be enabled for the evaluation under "Voice-Mailbox" - Basic Settings - Shared Voice-mailbox number and the future global number must be specified. 2) The Welcome Mail must contain the valid "Voice-mailbox number" for all users. §OthetelephoneNumber (phone number - other). "Route by Redirection" can only be used when the PBX forwards the actually dialed phone number as RedirectionNumber (or Diversion Number / diversion leg info with QSIG). In addition, it must be ensured that when using "E.164" also this call number is transmitted as E.164 call number. In the following tests, please note that the ixi-UMS kernel service must be terminated. If the tests are completed after the base configuration is complete, you must open the Windows Services console and stop the ixi-UMS Kernel service. b)Set up a call forwarding on the telephone to the number of the common voice-mailbox number. c)Activate the "wait for call" button (if necessary change the timeout) and call from your mobile phone on the phone. 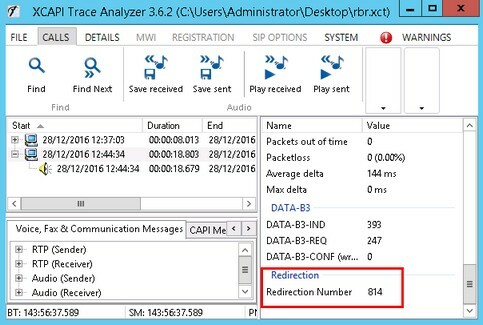 In the field "redirection phone number", you will be shown what the telephone system transmits to ixi-UMS Business. It must be either the extension number or (with using E.164) the E.164 number of the phone. c)Set up a call forwarding on the telephone to the number of the common voice mailbox number. d)Call from your phone on the phone. 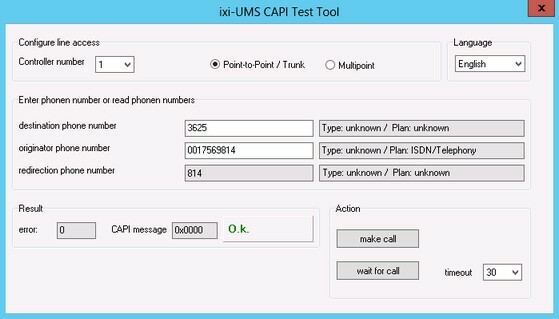 When the call is displayed in the test tool, you can hang up again. e)Open the trace and select the test call. f)On the right hand side, you will see the "redial number".